Over 100,000,000 downloads! Apple Design Award Winner 2015! Crossy Road™ is the #1 viral smash hit you’ll never stop playing. This tutorial shows you how to unlock all Secret Crossy Road Characters! Scroll down for older unlocks. If you know how to unlock new secret characters or if you simply want to leave us a comment, you can do that at the bottom of the page. The Crossy Road Arctic update added 12 new Crossy Road characters. The total character count went up to 172. There are 10 new characters and 2 new secret characters. The characters, which can be obtained by the prize machine are: Puffin, Lost Penguin, Arctic Hare, Arctic Fox, Lemming, Narwhal, Wolverine, Walrus, Polar Bear. 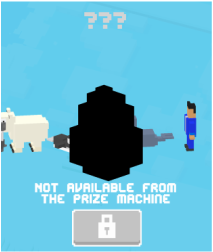 ​If you know how to unlock the 2 new Crossy Road secret characters, let us know in the comments! Play as the Polar Bear and complete all 5 mission by collecting the required items in the ice floating world. Once you complete the 2000 coin mission, which requires 1000 items, the Crossy Road Secret Character Seal will be unlocked. Play each of the Arctic characters from Puffin to Walrus and jump at least one time into the water. Once you died in the water with Puffin, Lost Penguin, Arctic Hare, Arctic Fox, Lemming, Narwhal, Wolverine and Walrus (not necessarily in this order) the Crossy Road Secret Character Iceberg will be unlocked! Play as the New Year’s Doll character and catch up to the dragon like creature called Chinese Monster. Once you hit it and die in the all Chinese environment the new mystery character is unlocked! The video shows how to unlock the new Crossy Road Secret Character „Chinese Monster“ of the Crossy Road New Year’s Update 2016. 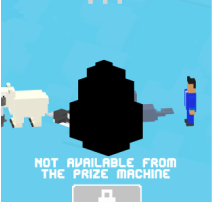 Important: So far this Character can only be unlocked on the Android Version of Crossy Road. We will inform you as soon as it it available on iOS. Play as the Tourist character and collect 5 coconut drinks in one round. Once you collected 5 coconut drinks and die in the all new Brazilian environment the new mystery character is unlocked! The new Crossy Road Secret Character „Coconut Water“ of the Crossy Road Brazil Update 2016 is a refreshing drink that perfectly fits to the brazil atmosphere of this new update. Play as the Grablin character. The Grablin will turn Crossy Road into a clicker game: You can beat Crossy Road characters by tapping and swiping the screen, they will have a hitpoints bar and different levels, so it will get more and more difficult to beat the enemies. It is said, that you have to beat a enemy of level 35 or above. We unlocked Purple Bloop three times so far using this method, but one time it didn’t work out. Hence, our guess is that it’s rather a certain amount of taps and swipes than the exact level of the enemy. Most likely you will need 500 taps, which is around the time, when you have beaten a level 35 enemy. Play as one of the Xmas characters like Snowman, Elf, Pudding, Reindeer or Tio de nadal, festive chicken, which is free for a limited time might work too. The world will turn into a new and all white snowy winter wonderland. What you have to do now is to search for the Yeti character who is throwing snowballs. Get hit by one of the snowballs and die. This will unlock the all new Yeti character. Play as one of the Monument Valley characters Ida, a Crow or the Storyteller and look for a floating totem head in the water. Jump on its head and once you die the Totem is unlocked. It’s very similiar to the Mystery Character Unlock of Hipster Whale or Nessie unlock.